CFS Review 5 THE DENVENTIONEER Dear Fan Eds, Because the Denvention is going to cost a lot of money, and we'll need all of it that we can get for advance expenses, a new and novel idea for a booster fanmag has been conceived. It might be termed a 'mutant' idea -- or better still, a FAPA mailing stapled under one cover. your support, naturally, is optional but we MUST have support to put it over. Please read the following closely, then drag out the hectos and mimeos and go to town! The mag will be large size (8 1/2" X 11") and called THE DENVENTIONEER. It will be published monthly and appear the first of every month. The CFS Review will likewise be published monthly, and appear the fifteenth of every month, or near there. Therefore there will be a periodical issuing from the headquarters of the Denvention every two weeks! 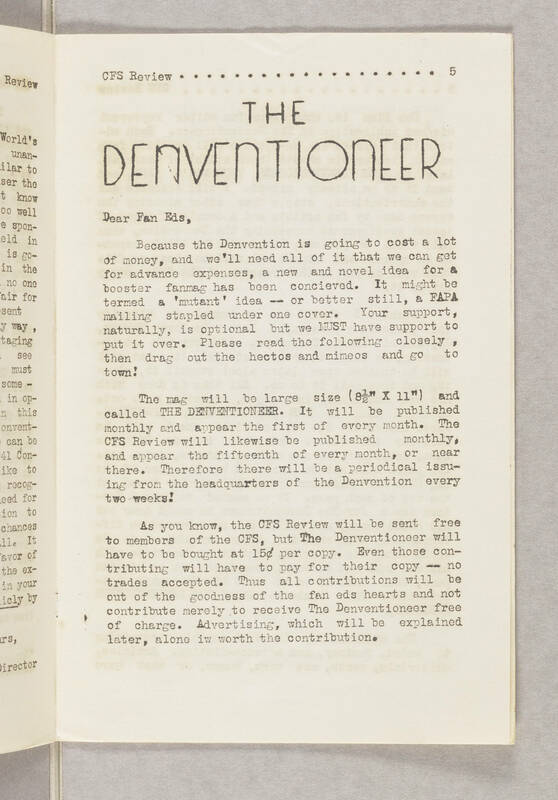 As you know, the CFS Review will be sent free to members of the CFS, but The Denventioneer will have to be bought at 15 cents per copy. Even those contributing will have to pay for their copy -- no trades accepted. Thus all contributions will be out of the goodness of the fan eds hearts and not contribute merely to receive merely to receive The Denventioneer free of charge. Advertising, which will be explained later, alone is worth the contribution.